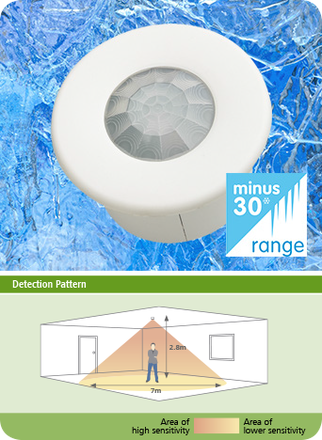 These compact PIR detectors provide automatic control for lighting used in cold storage and refrigeration environments. The PIR sensor can be mounted either flush into a ceiling tile or using a suitable surface mounting box making it perfect for refrigeration rooms where low level lighting has been fitted. The low profile design means the unit can be mounted in a narrow ceiling void. No external control boxes are required as the unit is self contained. PRM and DD versions' functionality is fully programmable using either the UHS5 or UNLCDHS handsets.